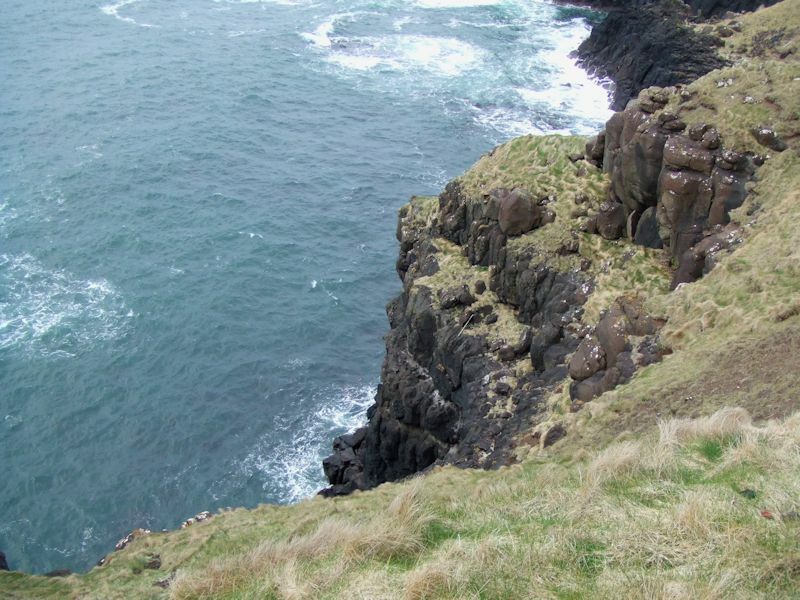 For decades, whenever we got the impulsive yen to visit Ireland (as one does), promptly we went off for some Highland fell-running in Scotland instead. This time, we had the majority vote (avoirdupois), but Kristin prevailed anyway, and finally we're going to have to look in on a bit of the Emerald Isle for our ownself. 9 April 2007. 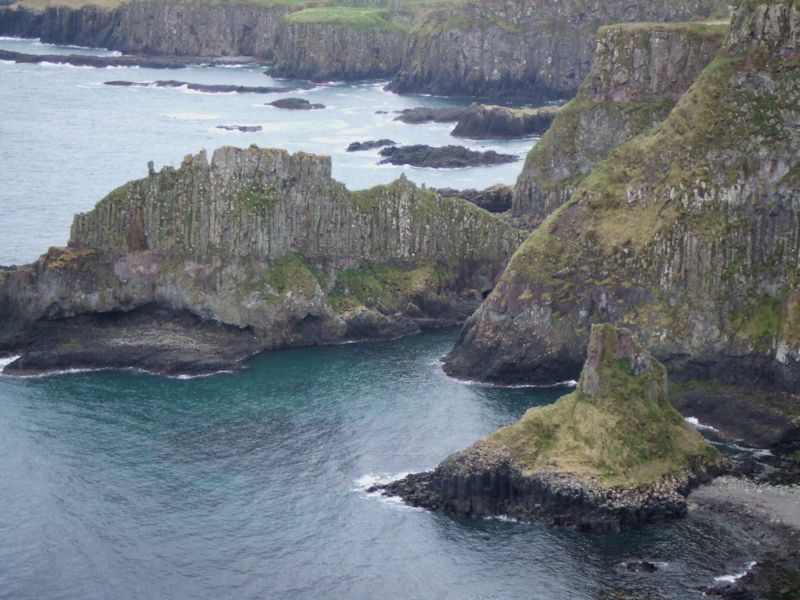 First stop, the Giants' Causeway in Northern Ireland (EasyJet Geneva-to-Belfast, AVIS Peugeot on the A26 northward), Northern Ireland's hottest tourist spot. 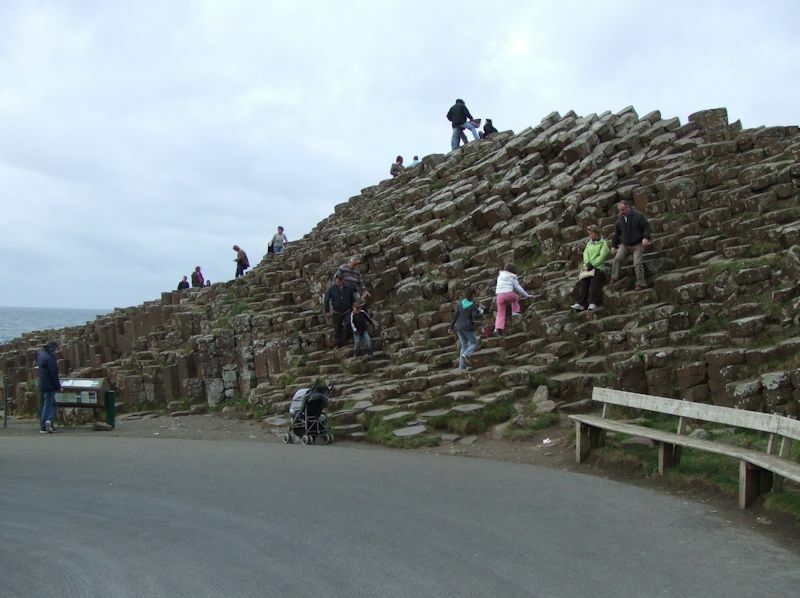 It's all something to do with ancient Irish mythology. 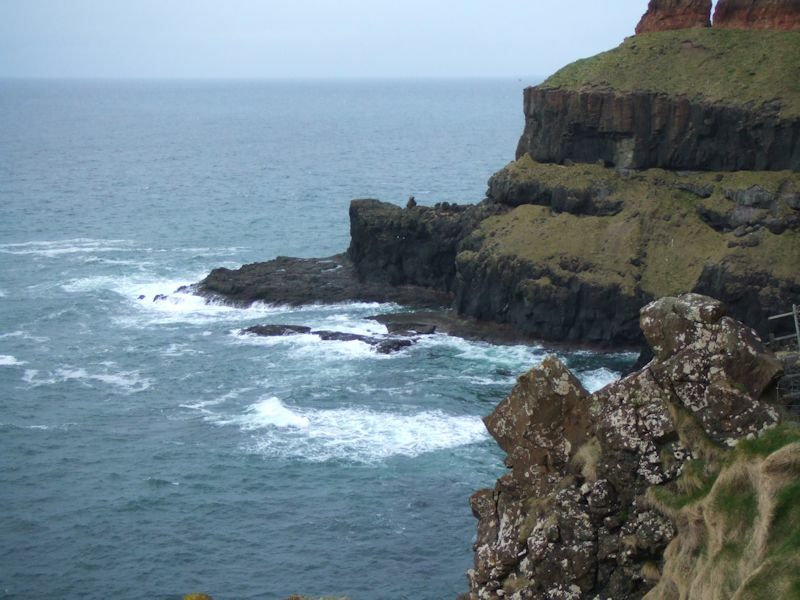 Great basaltic upthrusts along the coast, and, as if that were not enough, similar great basaltic upthrusts in Scotland just across the way, leading to the notion that in mythic times "Giants" (namely, Finn McCool, visiting his giant girlfriend in the Hebrides) used to pass to and fro across the sea here. 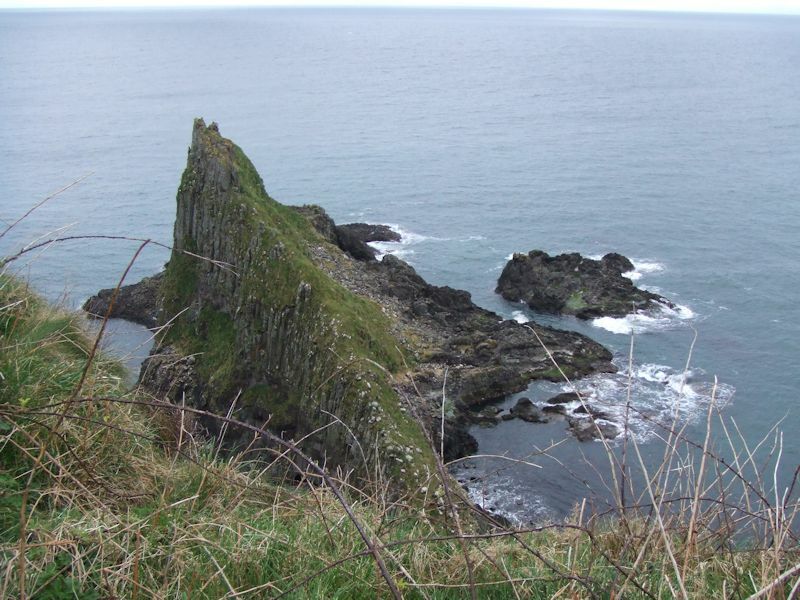 It's a UNESCO World Heritage site, too, so it's good for checking off on your munro-list of World Heritage sites seen. 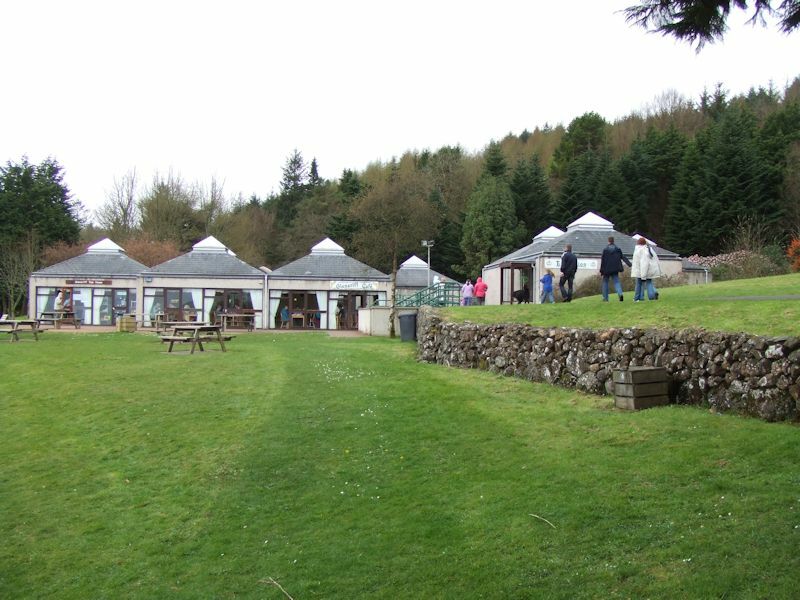 This is it (viewed from the National Trust centre, with tourist buses jostling to pass on the access road). Have we become jaded over the years? This really doesn't seem all that much to bark about. But, in the off season, it's still crowded with visitors in street shoes, so it must mean something to somebody. 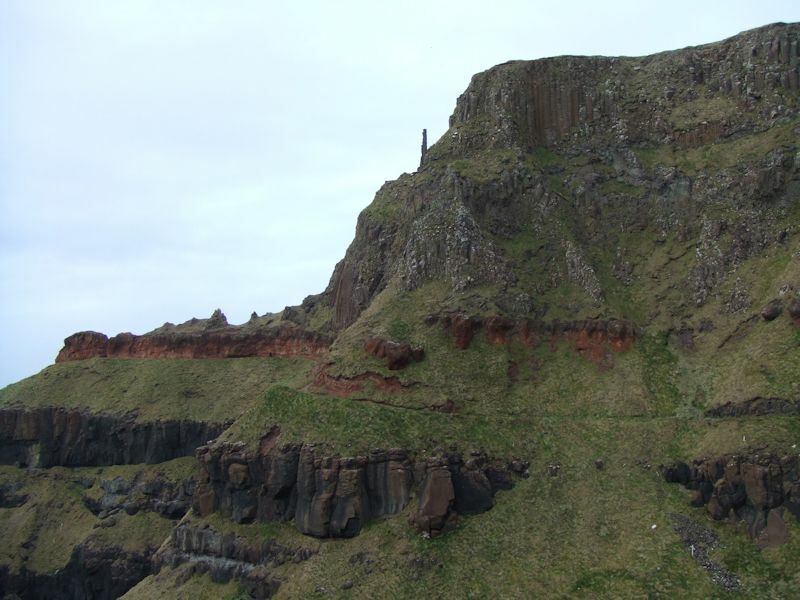 Disneyland on the Basalt. 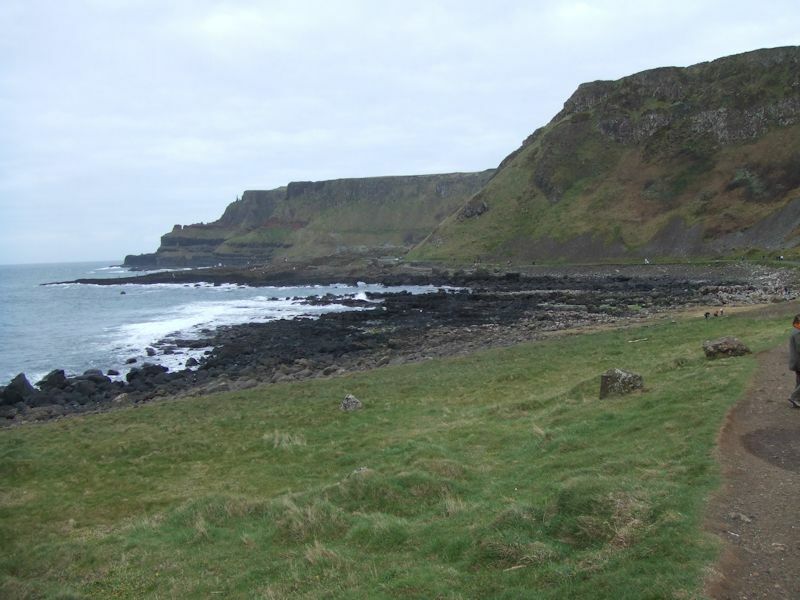 Judging from photos in the brochures, we seem to have caught the Causeway at a bad time -- to speak the truth for once, having come all this way, we're not going to pause, but rather we'll dash out along the coast path for some Good Walking. 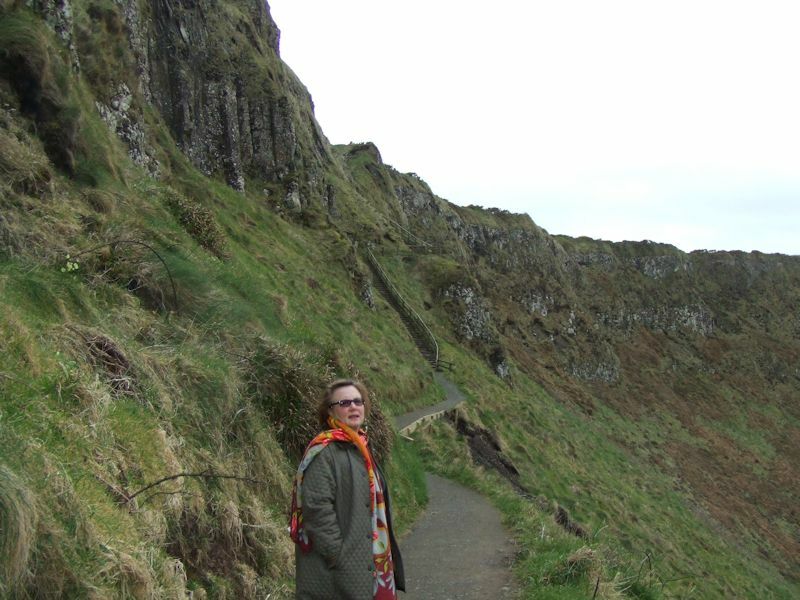 Kristin exulting in our coast-path walk, just before we found that there is no coast path. Not anymore, anyway. Basically, there was one, but it fell down, and apparently we're still waiting for beneficent private investors to come along and volunteer to fix it out of the goodness of their black little capitalist hearts. That's the lovely view downward, which will have to suffice, since we're not going any farther today. 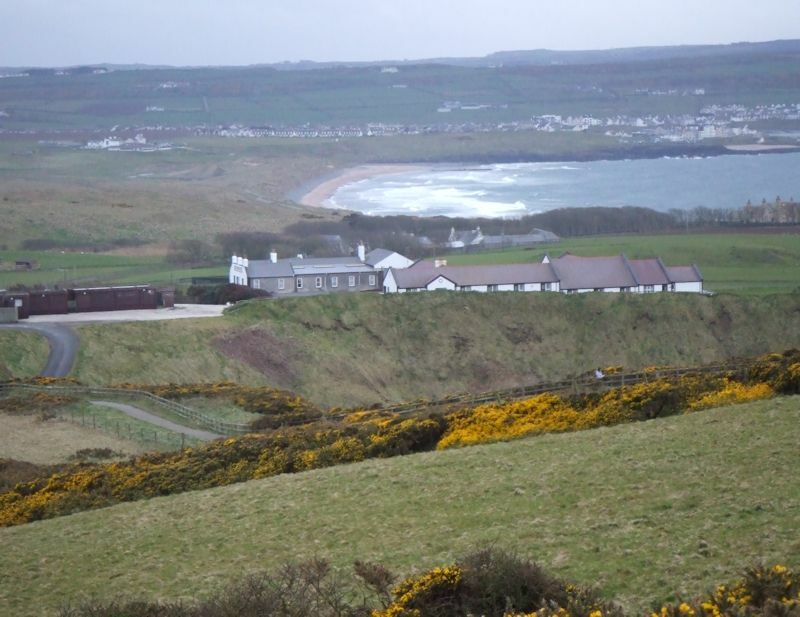 That's the interesting coastal path on the far side of the inlet, off-limits to all of us for a while until private investors find a possibility for handsome profits in it. 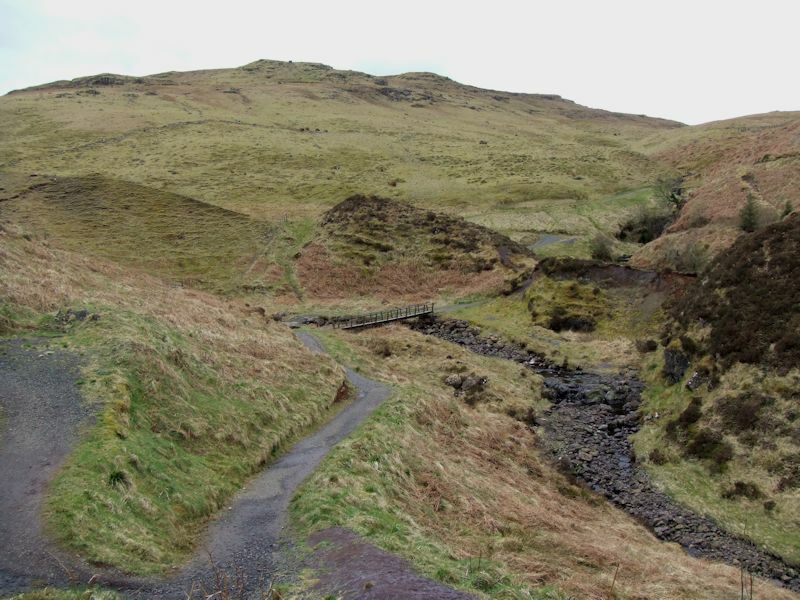 As a matter of fact, the landslide that seems to have condemned this path to eternal desuetude looked to us like a normal day at the office in the Alps, but perhaps the insurance liabilities are much higher here in Maggie Thatcher's aftermath. 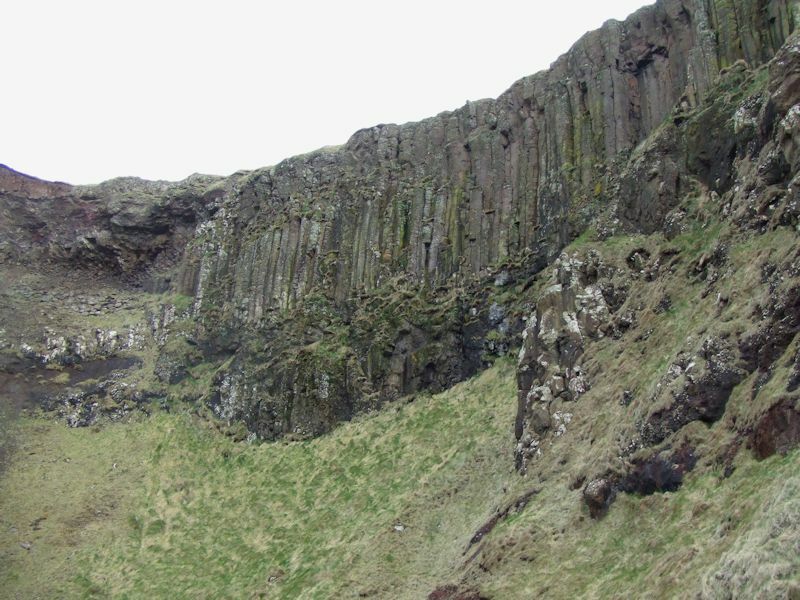 There are some of the famous basalt columns that are raved about. They certainly do look basaltic. 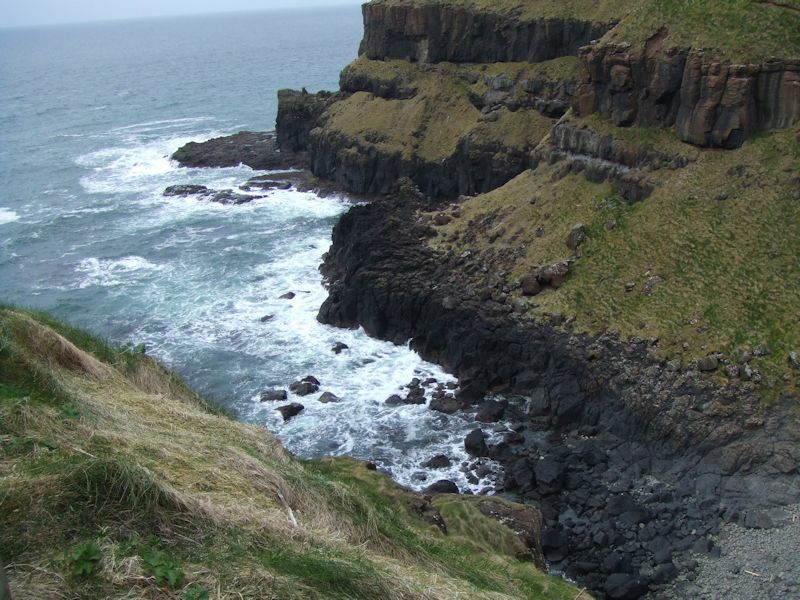 There is, luckily, another coastal path going all the way along at the top of those cliffs. 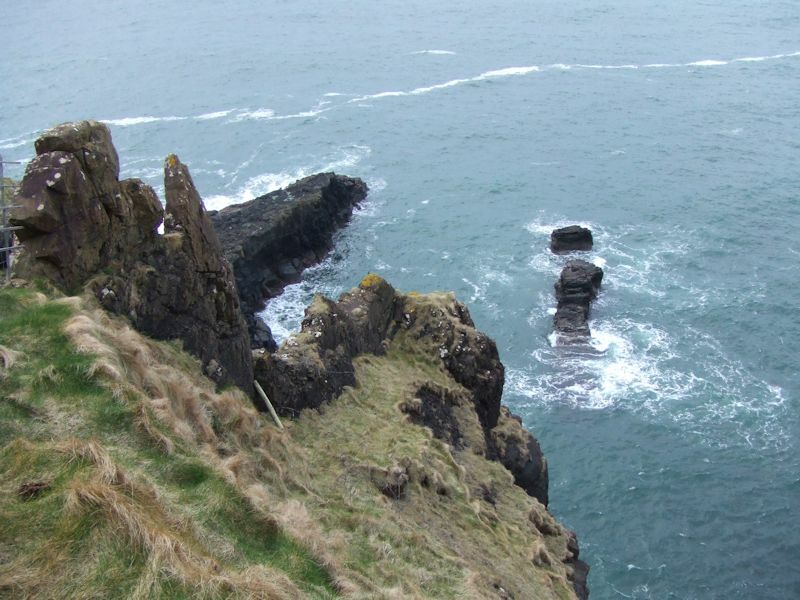 Right about here is where the Giants (like Finn McCool) used to pass back and forth to Scotland for reasons known only to themselves. 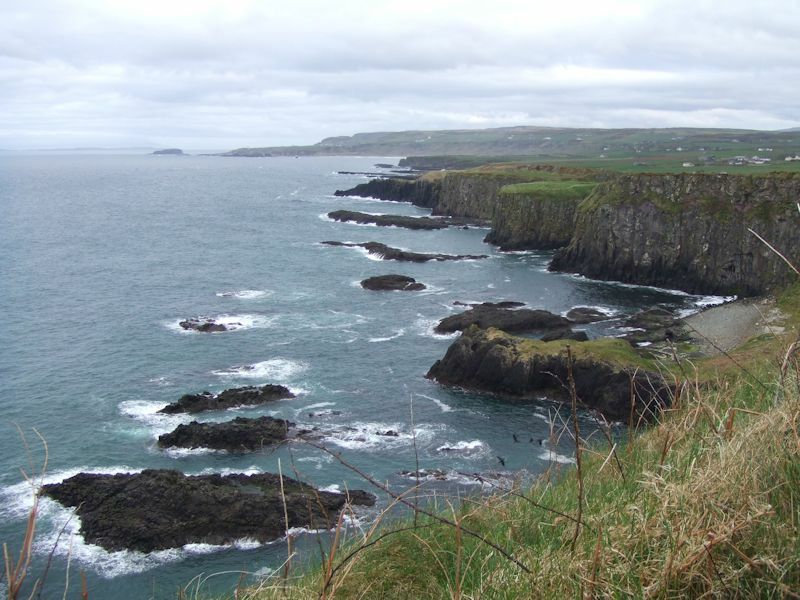 It's all extremely pretty, and thought-provoking, but if we want a good coastal walk we may have to go elsewhere. 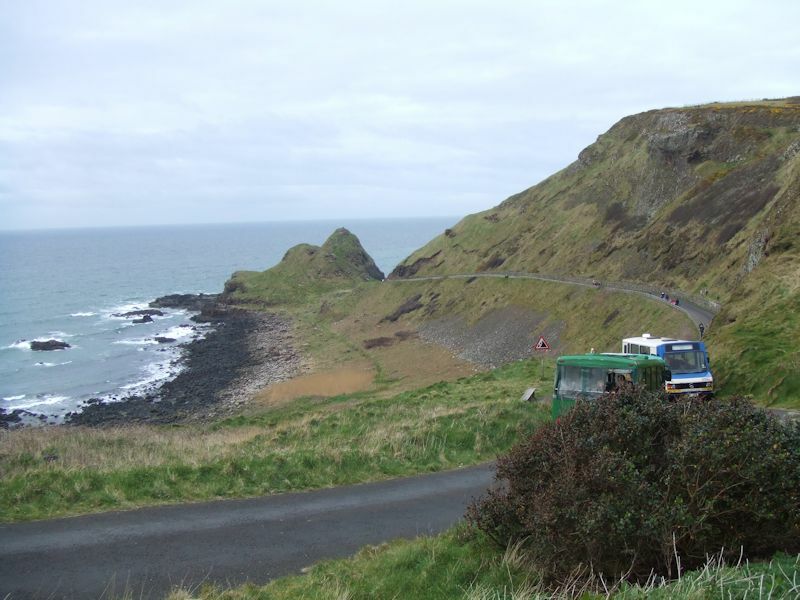 Reluctant to pass back by the Causeway, with the tourist buses queued at the end of the day, Kristin prefers to climb out of here by the road less traveled, i.e. 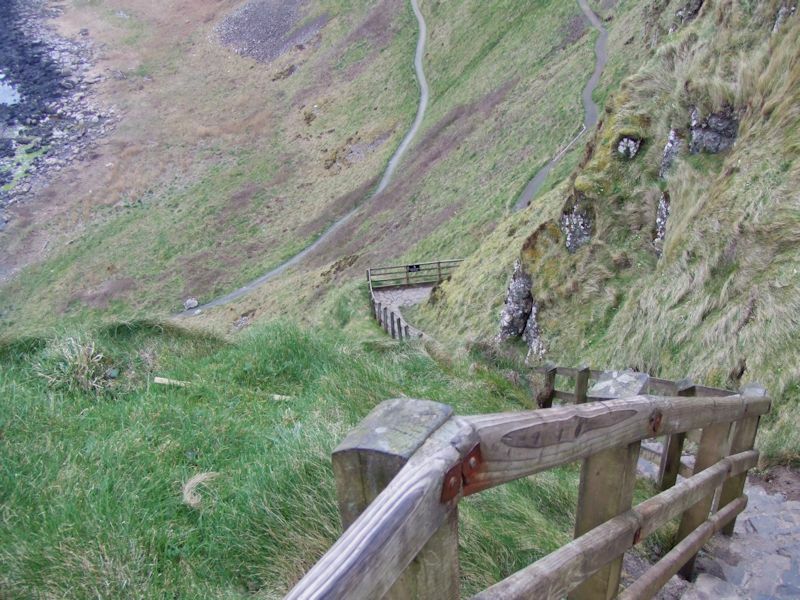 up that 60-meter stone stairway to Benbane Head to work up an ample appetite for dinner. One of your longer stairways and not yet wheelchair-accessible (but we've been in touch with our lawyers about this). 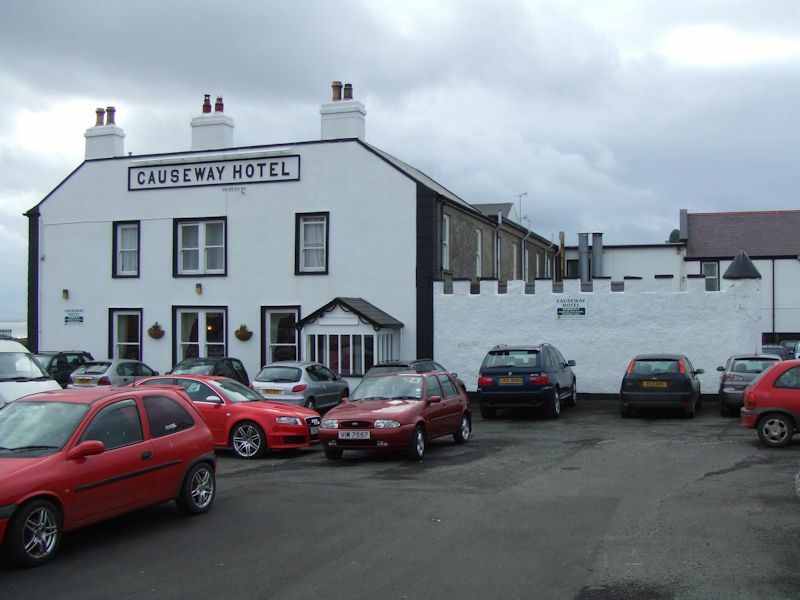 Back down to the Causeway Hotel for dinner -- Dinner! a horrific, low-priced heap of "mixed grill", not terribly tasty but enough for any of the Giants who passed this way (like Finn McCool) in the olden days: lamb, pork, 3 sausages, and quite a big shoeleather steak, with vegetables, salad, soup, and other stuff, and to put the tombstone on top of it, a big plate of 'chips' (french fries on greasy steroids). Even the 240-pounders in our party had to send most of it back to the kitchen at the end of the day, and go lie down. 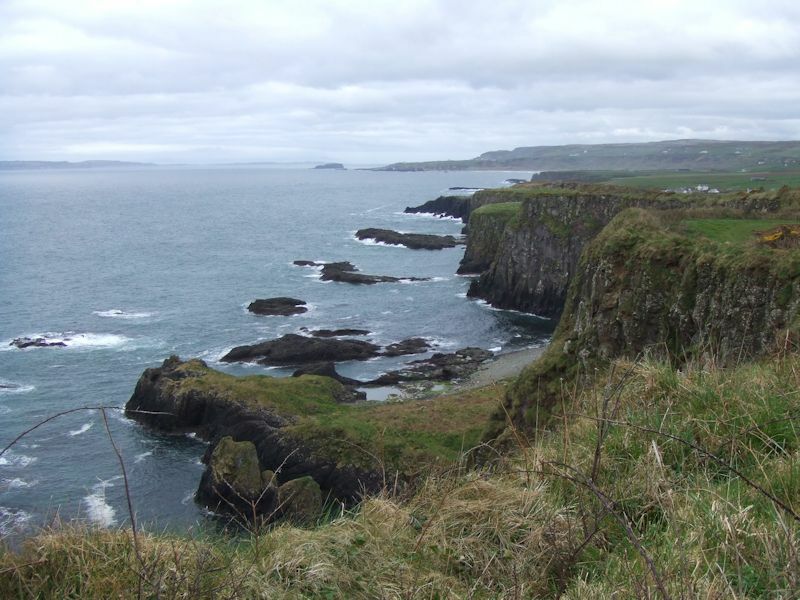 The famous Antrim Glens. 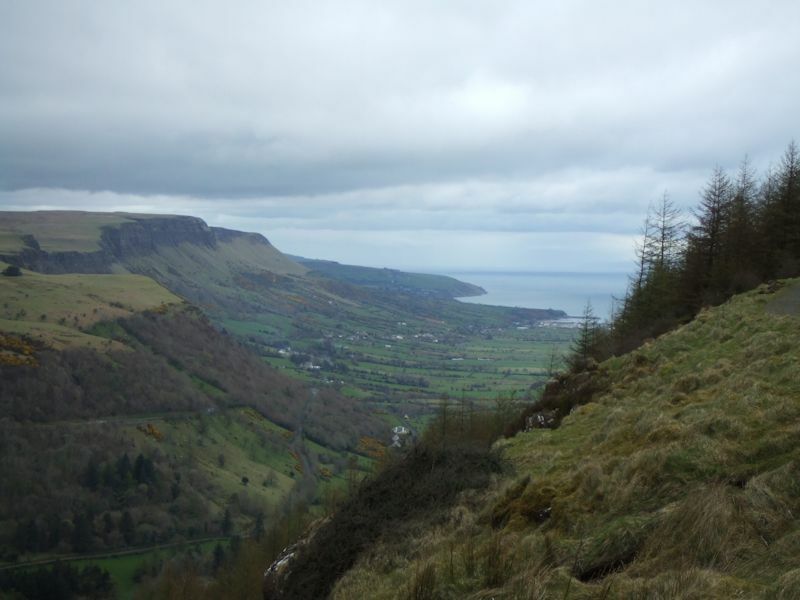 Lots of good walks, and a Nature Centre here at Glenariff Forest Park, as we get off to a promising start despite the chancy weather. 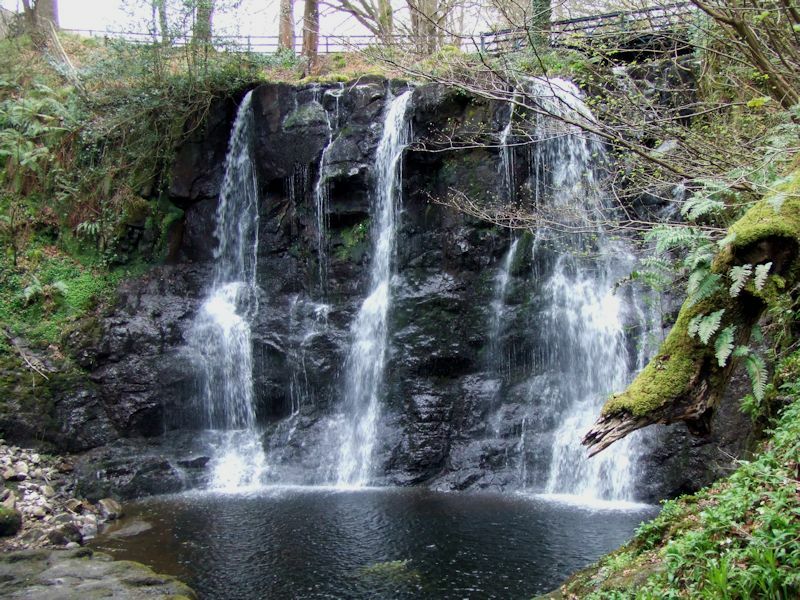 A major stop along the longest Glenariff walking path is this waterfall, which is pretty but . . . not something you'd normally remark upon in the Alps. There is a relativity to Tourist Impressions of things, and this one is fairly Relative. 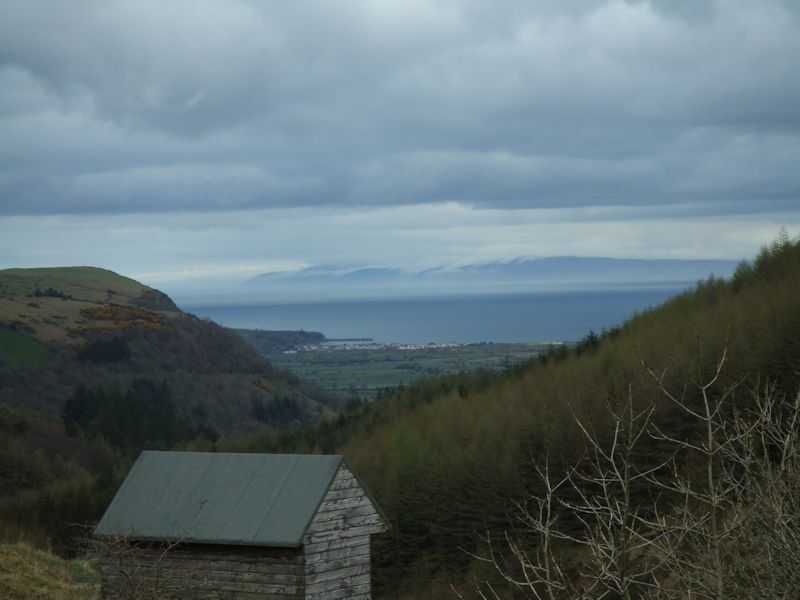 The view out the Glenariff to the northern coast near Ballycastle. Another look out towards Ballycastle, with Rathlin Island on the cloudy horizon and dinner at the Causeway Hotel on the front burner. CAUTION! Be careful! Be Especially Careful! 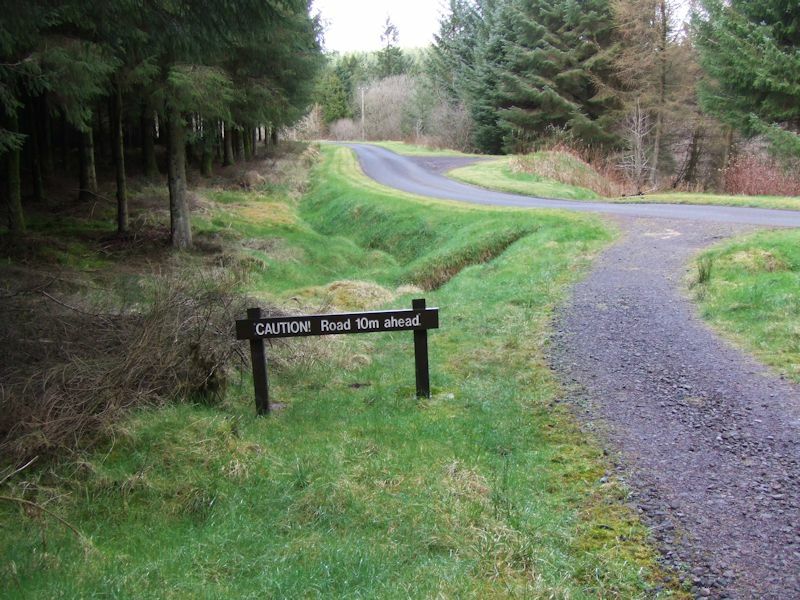 There is a road just 30 feet ahead. So be really really Careful. 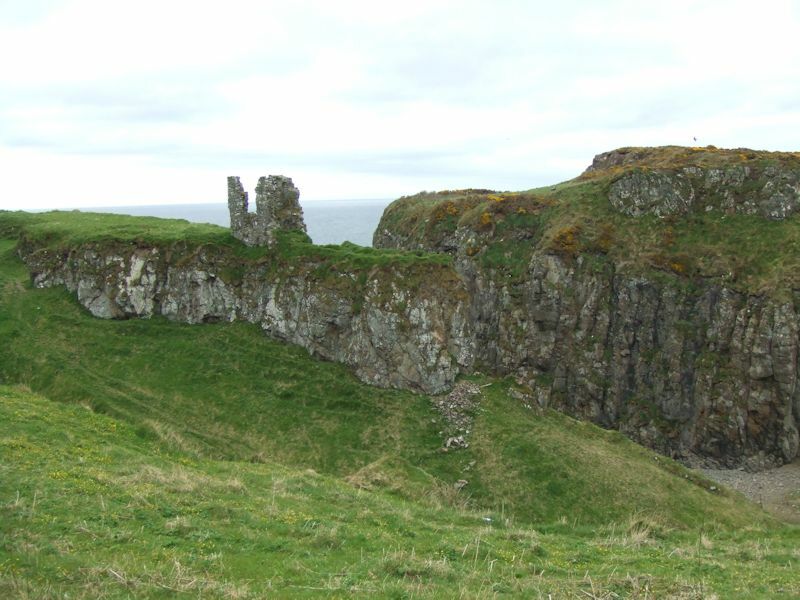 Dunseverick Castle -- or what's left of it, the poor thing. The coastal path runs past here, and we're going to venture out for a preprandial constitutional as dusk creeps in upon us. 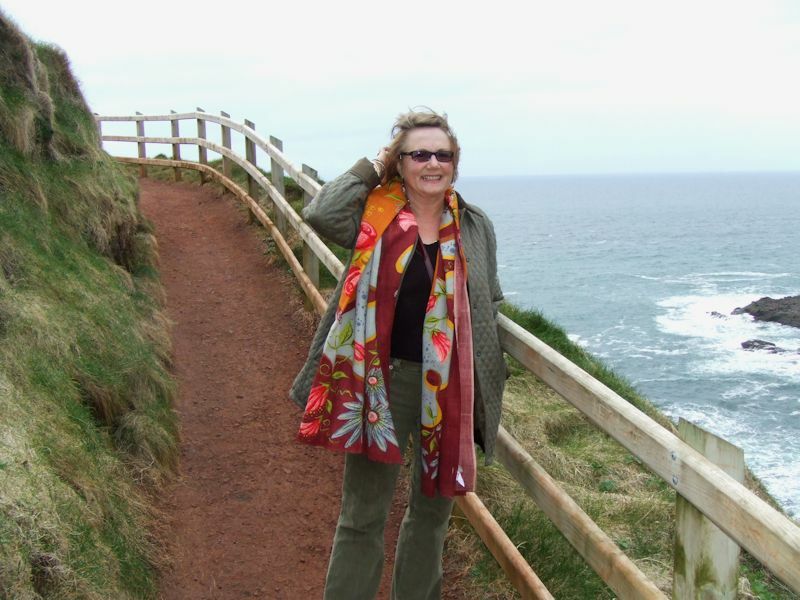 And another, as we rollick about desperately trying to work off another "mixed grill" at the Causeway Hotel in advance. 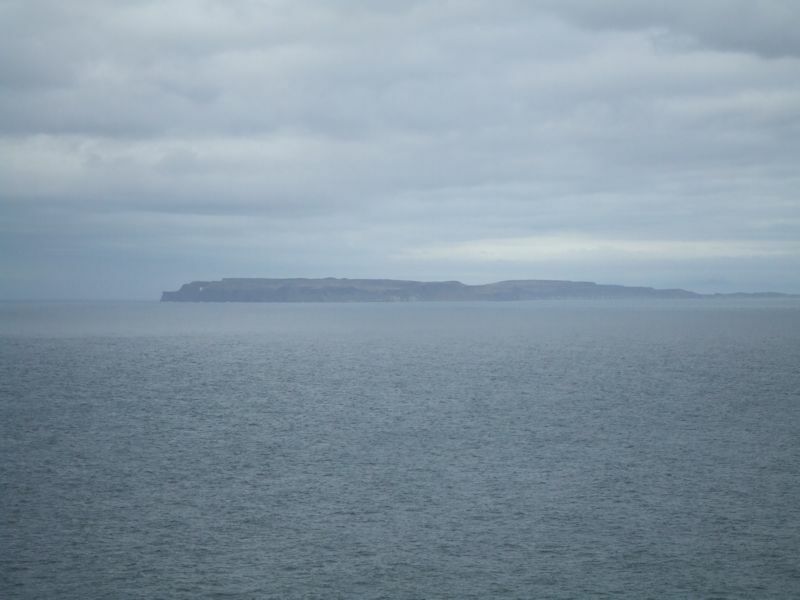 That's Rathlin Island five miles or so off the northern coast -- we're going there tomorrow, Ferry willing. It's back to the Causeway Hotel we are now: ample though mass-produced dinners, a lovely pub-bar, but with hordes of wedding parties and very large local groups even in the off-season. Somewhat cacophonic, though all seemingly very nice people. Extremely beautiful in the off hours, it is, but there aren't too many off hours. Must be a Treat in the high season. 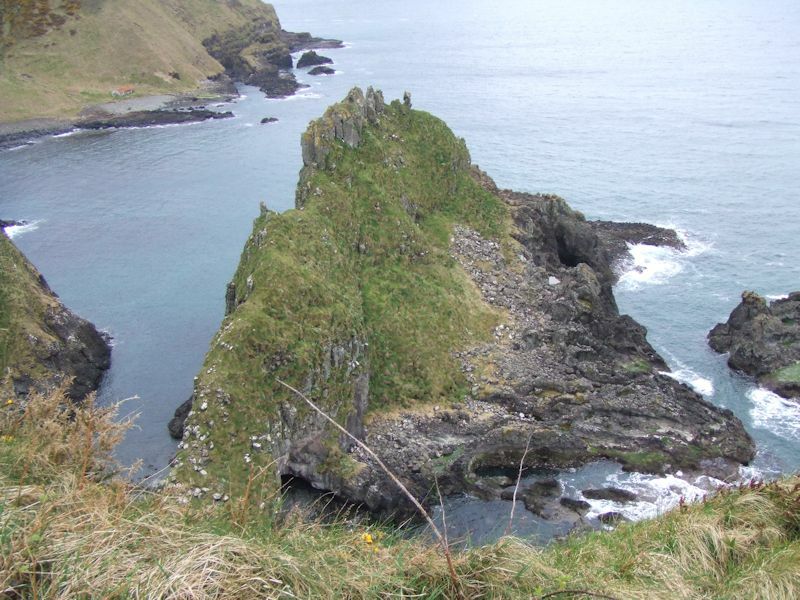 Anyway, tomorrow we're headed out to Rathlin Island to see what's on offer out there. Feedback and suggestions are welcome if positive, resented if negative, . All rights reserved, all wrongs avenged. 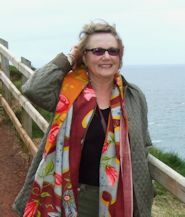 Posted 11 May 2007, revised 10 February 2007, 11 August 2014.